Adults only! Add a gourmet touch to a favourite summer dessert. 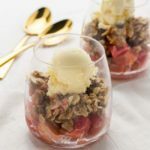 This Gran Marnier Strawberry Rhubarb Crisp is a great dessert for a crowd. Warm, bubbly fruit, a crunchy gluten-free topping and a hint of sweet oranges kick this popular rustic dessert up a notch. 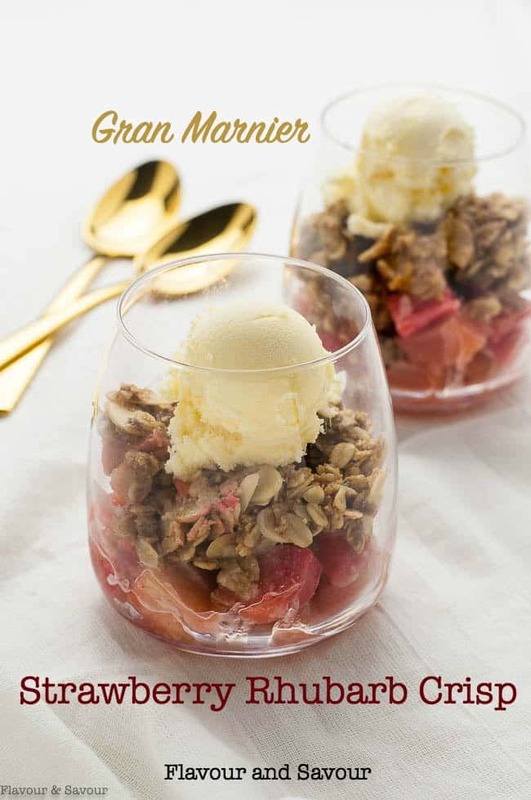 This Gran Marnier Strawberry Rhubarb Crisp makes a perfect end to a summer meal. 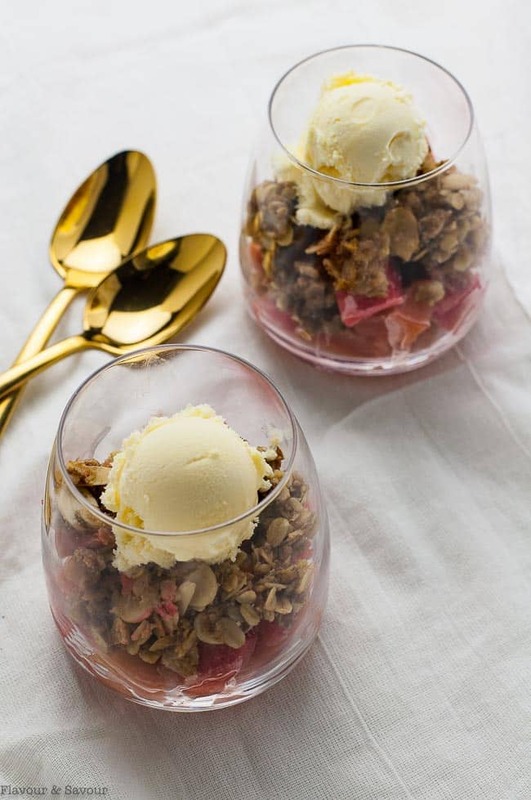 Is it a Strawberry Rhubarb Crisp or a Strawberry Rhubarb Crumble? What’s the difference? It really doesn’t matter, because it’s just so good, no one will care what you call it. Crisp and crumble are terms that are used interchangeably for this classic fruit dessert. The fruit bubbles, the oats crisp up as it cooks and the combination of the two is heavenly. And a scoop of ice cream on top doesn’t hurt, either. 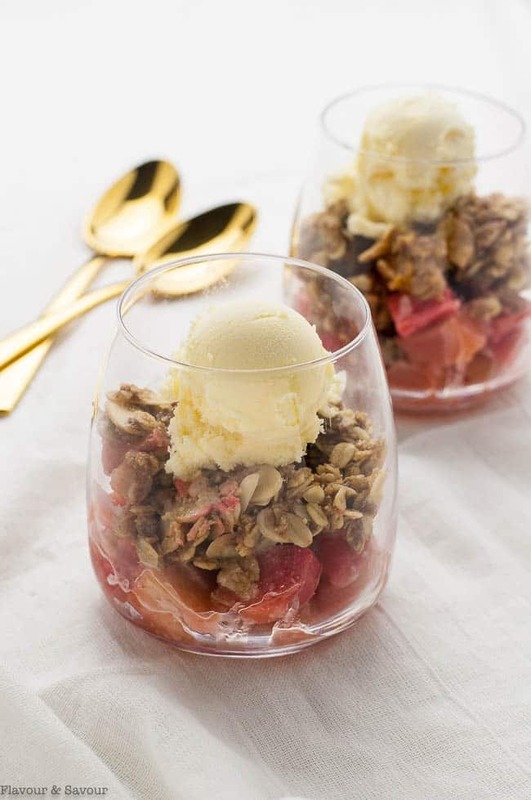 To make this crowd-pleasing dessert, combine diced rhubarb and sliced strawberries with sweetener, orange liqueur (like Gran Marnier, Contreau, or Triple Sec) and cornstarch. Transfer the mixture to a greased 8-inch square (or 9-inch round) baking dish. Combine oats, oat flour, coconut sugar (or brown sugar) and flaked almonds with butter until crumbly, then sprinkle on top of the fruit. Place the dish on a baking sheet in case the fruit bubbles over. Bake for 40-45 minutes or until the topping has browned and the juices are bubbling up around the edges. That’s it! Easy. Nutritious. Delicious! Serving a large group? Double the recipe, bake in a 9 x 13″ pan for 45 to 55 minutes. 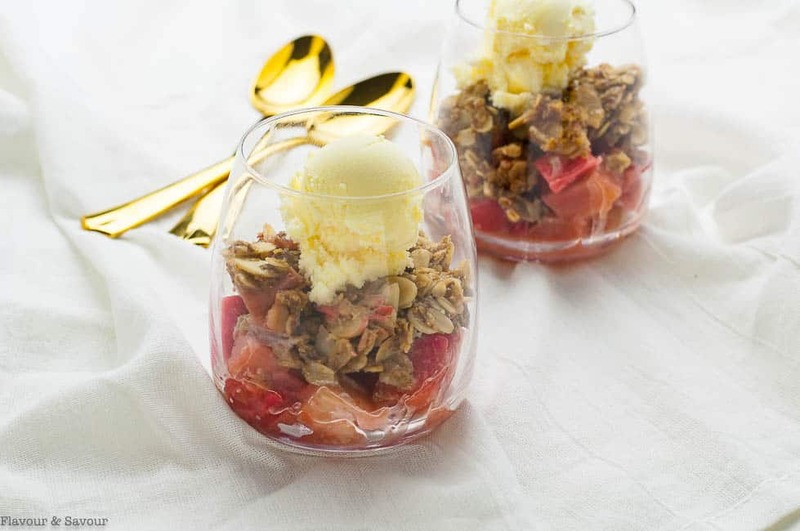 Showcase summer fruit with this always popular Gran Marnier Strawberry Rhubarb Crisp. Warm bubbly fruit with a crunchy oat and almond topping makes a great gluten-free dessert for a large group. Combine diced rhubarb and strawberries with sugar, cornstarch, orange zest and orange liqueur. Spread in a greased 8-inch square or 9-inch round baking dish. Combine topping ingredients. Sprinkle evenly on top of the fruit. Place baking dish on a baking sheet in case the fruit bubbles over. Bake at 375°F for 40 to 45 minutes or until top has browned and fruit is bubbling up around the edges. 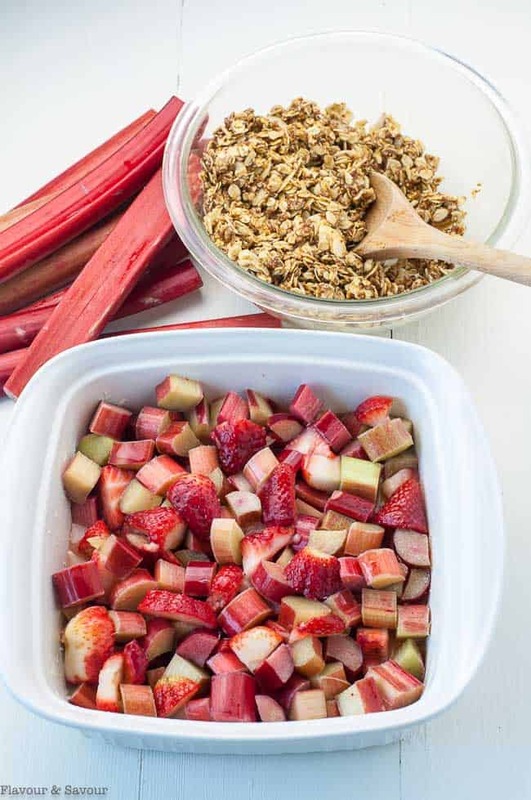 This recipe reminds me of a strawberry rhubarb pie I ate years ago and I remember being pleasantly surprised at how good the combination of strawberries and rhubarb was. And I like that this is a small serving size as opposed to a big pie! I’m looking forward to trying this out…and love that it’s gluten-free! Love that classic combo too! It’s easy to make it certified gluten-free with gluten-free oats, too. This would definitely be a crowd pleasing dessert for a summer gathering! And I love that it can be made dairy-free! Yes, there are lots of dairy-free ice cream alternatives available now. I like the coconut milk ice creams. Yum. 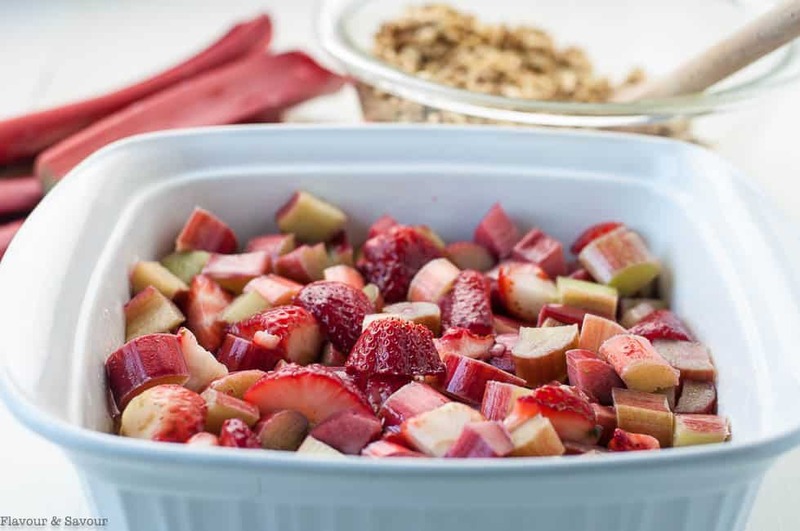 You’re right–sometimes cooked rhubarb turns out looking an unappetizing brown colour, but the strawberries make it red! Thanks Lizzy! Yes–that orange flavour kicks it up a notch! I can picture myself eating lots of these this summer, sitting on the back step with a belly full of bbq food. Awesome recipe, Elaine!! Thanks Nicole! That’s a fun summertime image!